The use of monoclonal antibodies (mAbs) for therapy improves the survival of patients with disseminated cancer. However, the antibody treatment is rather cytostatic than cytotoxic and in addition, many tumors develop a resistance to antibody therapy. Conjugation of mAbs with cytotoxic drugs or radionuclides increases their therapeutic potential. The use of radionuclides as cytotoxic payload offers the advantage of “cross-fire” effect, when particles emitted by nuclides specifically delivered to cancer cells irradiate other surrounding cancer cells (1). Therefore, it is unnecessary to deliver radionuclides to every malignant cell in a cluster. Clinical mAb-mediated radionuclide therapy (radioimmunotherapy, RIT) has demonstrated a high potential for treatment of radiosensitive hematologic malignancies, but has failed to improve the survival of patients with solid tumors (2). Several biodistribution features of whole-length mAbs contributed to the failure to deliver sufficient dose to the tumors without damaging healthy tissues, e.g. long residence time in circulation, poor extravasation and limited penetration into tumor mass. These features are to a high extent determined by the large size of mAbs. One approach to overcome problems of RIT is pretargeting. In this case, a mAb fitted with a recognition tag is injected first. After mAb localization in the tumor and its clearance from blood and other non-targeted compartments, a radiolabeled secondary agent, which can bind specifically to a recognition tag, is injected. The secondary agent is typically smaller, which provides rapid extravasation and localization in tumors, as well as a rapid clearance from blood. Proof-of-concept of pretargeting was demonstrated using an avidin-biotin system for secondary recognition (3-4). The major issue with this system was the immunogenicity of (strept)avidin (4) and interference with endogenous biotin (5). To overcome this, a number of alternative approaches to secondary recognition have been developed. Examples are the development of bispecific antibodies, with one of the arms being specific to a small radiolabeled hapten (6), the use of interactions of complementary oligonucleotides or their analogues (7-9), and the use of bioorthogonal chemistry, e.g. the reaction between trans-cyclooctene and electron-deficient tetrazines (10). In this study, we evaluated pretargeting using Affibody molecules as targeting agents. Affibody molecules are small (7 kDa), non-immunoglobulin scaffold proteins that can be selected to bind with high affinity to cancer-associated molecular targets (11). Numerous preclinical studies demonstrated that Affibody molecules can efficiently and specifically image tumor xenografts in vivo (12). The radiolabeled Affibody molecule ABY-025 has demonstrated specific high-contrast imaging of HER2-expressing tumors in clinical studies (13). Clinical studies suggest that Affibody molecules are non-toxic and non-immunogenic. However, the renal clearance of Affibody molecules is accompanied by nearly quantitative reabsorption and rapid internalization in proximal tubuli. In the case of residualizing labels, this causes radioactivity accumulation in kidneys that is several-fold higher than the accumulation in tumors. This prevents the use of such promising therapeutic radionuclides as the low-energy beta emitters 177Lu or 161Tb for Affibody-mediated therapy. Nevertheless, features of the Affibody molecules such as very slow internalization (20-30% after incubation during 24 h) and rapid blood clearance (14) make them attractive as primary targeting agents in pretargeting. In this study, we evaluated an Affibody-based pretargeting mediated by peptide nucleic acid (PNA) interaction with complementary PNA (Figure 1 B). In a DNA polymer, the backbone is made up of repeating deoxyribose-phosphate groups whereas PNA has a pseudopeptide backbone made up of N-(2-aminoethyl)-glycine units connected through amide bonds (Figure 1 A). PNA is capable of selective and high affinity hybridization to a complementary PNA strand obeying the Watson-Crick hydrogen-bonding rules (15). Importantly, PNA is non-immunogenic and non-toxic (16-18). In addition, PNA is not degraded in vivo by peptidases or nucleases, as it is neither a regular peptide, nor a nucleic acid. Earlier studies (8, 19-20) have demonstrated the feasibility of PNA-PNA-hybridization in vivo. It has to be noted, that in these studies PNA-conjugated beads instead of tumors were used as models, or non-specific accumulation of avidin-PNA in tumors and inflammation sites were used, to deliver non-labeled PNA to areas of interests. Strictly speaking, true molecular target-specific PNA-mediated pretargeting has not been shown. The aim of this study was to provide a proof-of-principle for Affibody-based PNA-mediated pretargeting. The main hypotheses were that i) an Affibody-PNA chimera can specifically localize in tumors, ii) Affibody-based PNA-mediated pretargeting provides specific accumulation of radiolabeled PNA in tumors, and iii) Affibody-based PNA-mediated pretargeting can provide higher accumulation of radiometals in tumors in comparison to kidneys. To test these hypotheses, two complementary PNA-based hybridization probes, HP1 and HP2, were designed (Figure 1 C). HP1 has a three-glycine motif in the N-terminal and was designed to be covalently attached to a recombinantly expressed Affibody molecule, ZHER2:342-SR-H6 (Figure 1 C), via sortase A mediated ligation. A versatile DOTA chelator was introduced in the design of HP1, and is thus present in the Affibody-PNA chimera ZHER2:342-SR-HP1 (Figure 1 C). The chelator could be labeled with 111In or 68Ga for pretreatment monitoring of ZHER2:342-SR-HP1 accumulation in tumors using SPECT or PET, respectively. This theranostic approach enables selection of patients, which accumulate sufficient amount of primary probe in tumors and would most likely respond to Affibody-based pretargeted therapy. The secondary hybridization probe HP2 was conjugated with both a DOTA chelator and a tyrosine. The use of DOTA enables labeling with a broad range of radiometals suitable for therapeutic applications, such as 177Lu, 47Sc, 161Tb, 212Bi, 213Bi, and 227Th. The introduction of tyrosine makes labeling with a therapeutic radiohalogen, 131I, possible. In this proof-of-principle study, we used surrogate radionuclides, 111In as a radiometal and 125I as a radioiodine. Detailed descriptions of materials, equipment and methods used in this study are, unless otherwise stated, given in the Supplementary Material. A detailed description of materials and methods used for the molecular cloning and expression of recombinant proteins, the synthesis of pretargeting hybridization probes and the sortase A mediated ZHER2:342-SR-HP1 ligation is provided in reference (21). For in vitro studies, human ovarian cancer SKOV-3 and human breast cancer BT474 cell lines with high (over 106 receptors per cell) HER2 expression (22-23) were used. As in vivo models, HER2-positive SKOV-3 ovarian cancer and HER2-negative Ramos lymphoma xenografts were used. All cell lines were from American Type Culture Collection (ATCC). Cells were cultured in RPMI medium (Flow Irvine), supplemented with 10 % fetal calf serum (Sigma), 2 mM L-glutamine, and PEST (penicillin, 100 IU/mL, and streptomycin, 100 mg/mL; Biokrom Kg). A) Structure of DNA (left) and PNA (right). In a DNA polymer the backbone is made up of repeating deoxyribose-phosphate groups whereas PNA has a pseudopeptide backbone made up of N-(2-aminoethyl)-glycine units connected through amide bonds. B) Schematic illustration of two-step Affibody molecule-based PNA-mediated pretargeting in vivo. In step 1 the primary probe, the Affibody-PNA conjugate ZHER2:342-SR-HP1, is injected and allowed to bind to HER2-overexpressing tumor cells. After a certain time, selected to optimize the tumor-to-normal tissue ratio of ZHER2:342-SR-HP1, the radiolabeled secondary probe HP2 is injected in step 2. The 15-mer PNA sequence in HP2 is complementary to HP1 and the probe is designed to hybridize to the Affibody-PNA conjugate that has accumulated in the tumor in step 1. C) Sequences of hybridization probes, proteins and conjugates. Amino acids are given in one-letter code (upper-case) and PNA monomers in lower-case letters (a, c, g and t). DOTA and [AEEA] denotes the chelator 1,4,7,10-tetraacacyclododecane-1,4,7,19-tetraacetic acid and the spacer unit [2-(2-aminoethoxy)ethoxy]acetic acid, respectively. The parental sequence of the ZHER2:342 Affibody molecule is surrounded by bullets. In vitro specificity of 111In-ZHER2:342-SR-HP1 binding to HER2-expressing cells was tested by saturating receptors by addition of a large excess of an anti-HER2 ZHER2:342 Affibody molecule (24). Another set of experiments was performed to test if binding of radiolabeled HP2 to cells is dependent on pre-treatment with ZHER2:342-SR-HP1 and the PNA-PNA interaction. Cells were pre-incubated with ZHER2:342-SR-HP1 for 60 min, washed and radiolabeled HP2 was added to the cells. After incubation for 60 min, cells were washed, detached by trypsin and cell-associated radioactivity was measured. The following control experiments were performed: cells were treated with a large excess of parental anti-HER2 ZHER2:342 Affibody molecule to prevent ZHER2:342-SR-HP1 binding and with a large excess of non-labeled HP2 to prevent specific binding of radiolabeled HP2. Non-specific binding of radiolabeled HP2 without treatment by ZHER2:342-SR-HP1 was measured. For experimental details see Supplementary Material. In vitro cellular processing of 111In-ZHER2:342-SR-HP1 as well as of 111In-HP2 by HER2-expressing SKOV-3 and BT474 cells were measured, after interrupted incubation, by the acid wash method (24). 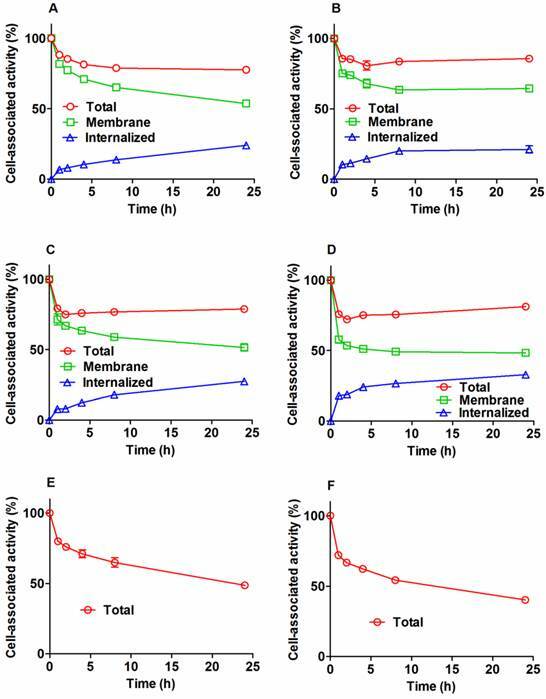 Cellular retention of 125I-HP2 was measured, after interrupted incubation, without discrimination between internalized and membrane-bound activity, as internalization would be underestimated for the non-residualizing radioiodine label. For experimental details see Supplementary Material. Binding affinities of 111In-ZHER2:342-SR-HP1 to HER2-expressing cells and 125I-HP2 to ZHER2:342-SR-HP1 bound to HER2-expressing cells were measured using LigandTracer Yellow and LigandTracer Gray instruments (Ridgeview Instruments AB, Vänge, Sweden) and analyzed by Interaction Map software (Ridgeview Diagnostics AB, Uppsala, Sweden) as described by Björkelund and co-workers (25). For experimental details see Supplementary Material. All animal experiments were performed in accordance with national legislation on laboratory animals' protection and have been approved by the ethics committee for Animal Research in Uppsala. Euthanasia was performed under Rompun/Ketalar anesthesia. A group of 4-6 mice was used for each data point. The mice were euthanized at predetermined time points post injection (p.i.) by overdosing of anesthesia followed by heart puncture and exsanguination. Blood and organ samples were collected and their weight and radioactivity were measured. Organ uptake values were calculated as percent of injected dose per gram of tissue (%ID/g). In the case of the dual label study, the whole spectrum of each sample was recorded. The use of γ-spectroscopy enabled the biodistribution measurement of 111In and 125I in each animal independently (26). To determine an optimal injection route, biodistribution of 111In-ZHER2:342-SR-HP1 (25 kBq; 1µg/mouse) was measured after intravenous and subcutaneous injection in NMRI mice (average weight 24±1 g) at 1, 4 and 24 h p.i. Earlier studies (27) have demonstrated that biodistribution of monomeric Affibody molecules in mice are nearly identical after intravenous and subcutaneous injection. The use subcutaneous injection of Affibody-PNA chimera might help to avoid two tail vein injections during the same day in pretargeting studies. In vivo stability of conjugates was evaluated according to the method developed for intact Affibody molecules by Marek-Kramer and co-workers (28). Two NMRI mice were injected with 111In-ZHER2:342-SR-HP1, 111In-HP2 or 125I-HP2 I the tail vein (1 MBq per animal). At 1 h after injections, the animals were euthanized and blood was withdrawn by heart puncture using a heparinized syringe. The samples were centrifuged (4500 g, 10 min, 4 oC). Radiolabeled probes (high molecular weight) were separated from radiocatabolites (low molecular weight) using NAP-5 columns (5-kDa cut-off) eluted with PBS. Radioactivity of each fraction was measured, and a percentage of radioactivity in high-molecular-weight fraction was calculated. For establishing HER2-positive xenografts, ca. 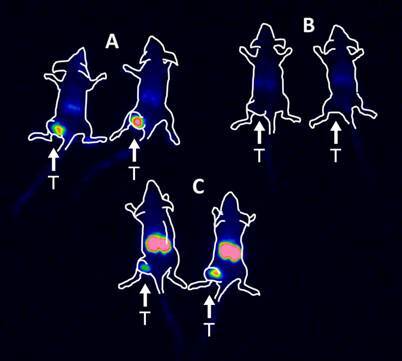 107 SKOV-3 cells were subcutaneously implanted in the right hind leg in BALB/C nu/nu mice. For HER2-negative controls, ca. 5x106 Ramos cells were subcutaneously implanted. At the time of experiments, the average animal weights were 18±3 g and 19±1 g for mice bearing SKOV-3 and Ramos xenografts, respectively. The average tumor weights were 0.3±0.2 g and 0.28±0.2 g for SKOV-3 and Ramos xenografts, respectively. Specificity of ZHER2:342-SR-HP1 binding to HER2 in vivo was tested by injection of 5 µg (30 kBq) 111In-ZHER2:342-SR-HP1 in two groups of mice bearing SKOV-3 xenografts and one group bearing HER2-negative Ramos xenografts. One group with HER2-positive SKOV-3 xenografts was co-injected with an excess amount (500 µg) of non-labeled parental ZHER2:342 Affibody molecule. The biodistribution was measured at 5 h after injection. To evaluate the influence of injected probe dose on tumor targeting, a dual label study was performed. Mice were injected with 111In-ZHER2:342-SR-HP1 (20 kBq per mouse). The injected probe dose was adjusted with non-labeled ZHER2:342-SR-HP1 to 5 (two groups), 30 or 100 µg per mouse. At 4 h after injection of ZHER2:342-SR-HP1, the mice were injected with 1 µg (20 kBq) of 125I-HP2. In addition, one group of mice pre-injected with 5 µg ZHER2:342-SR-HP1 was injected with 5 µg 125I-HP2. To test if the tumor accumulation of 125I-HP2 is mediated by ZHER2:342-SR-HP1, one group of mice was injected with 1 µg (20 kBq) 125I-HP2 without pre-injection of ZHER2:342-SR-HP1. All animals were sacrificed and the biodistribution was measured at 1 h after injection of 125I-HP2. To evaluate pretargeting of 111In-HP2 and test its specificity, two groups of mice were injected with 1 µg (30 kBq) 111In-HP2, and the biodistribution was measured at 1 h after injection. One group was pre-injected with 100 µg ZHER2:342-SR-HP1 4 h before injection of 111In- HP2. Imaging was performed to obtain a visual confirmation of ex vivo measurements. Mice bearing SKOV-3 xenografts were used. Four animals were injected with 1 µg of 111In-HP2. Two of these mice were pre-injected with100 µg ZHER2:342-SR-HP1 at 4 h before injection of 111In-HP2. For comparison, two mice were injected with 2 µg of previously studied 111In-DOTA-ZHER2:K58 (29) Affibody molecule. All animals were injected with 650 kBq of the radiolabeled compounds 1 h before the image acquisition. Immediately before imaging (1 h p.i. ), the animals were sacrificed by cervical dislocation. A single image of all animals was acquired simultaneously. The imaging experiment was performed using a GE Infinia gamma camera equipped with a medium energy general purpose (MEGP) collimator. Static images (30 min) were obtained with a zoom factor of 3 in a 256×256 matrix. The production of hybridization probes, ZHER2:342-SR-H6 and the ZHER2:342-SR-HP1 chimera is described in detail in a separate paper (21). Briefly, the PNA-based hybridization probes, HP1 and HP2, were successfully assembled using commercially available building blocks and Fmoc-protected solid-phase chemistry according to standard procedures. The bacterial transpeptidase sortase A was used to site-specifically and irreversibly attach HP1 to a recombinantly expressed anti-HER2 Affibody molecule, ZHER2:342-SR-H6, to produce the Affibody-PNA chimera, ZHER2:342-SR-HP1. The identity of the hybridization probes and the Affibody-PNA chimera was verified using electrospray mass spectrometry. The final purity of ZHER2:342-SR-HP1 and HP2, used for in vitro and in vivo studies, was analyzed with HPLC and estimated to be >90 and >95%, respectively. ZHER2:342-SR-HP1 was labeled with 111In with a yield of 96.8±0.0%. The purity after NAP-5 size-exclusion chromatography purification was 99.2±0.0%. Labeling of HP2 with 111In provided a yield of 86.6±10.4% and a purity of 96±6% after NAP-5 purification. A challenge with 500-fold excess of EDTA during 4 h confirmed stability of both 111In-labeled conjugates. 125I-iodination of HP2 resulted in 85±12% yield and 96±6% purity after purification using NAP-5. A stability test revealed no measurable release of radioiodine after 4 h incubation in human serum at 37 oC. Binding of 111In-ZHER2:342-SR-HP1 to HER2-expressing SKOV-3 and BT474 cells was significantly (p<0.00005) reduced by pre-saturation of receptors by non-labeled anti-HER2 Affibody molecule (Figure 2 A and B). In addition, binding to HER2-negative UN-SCC74B cells was 400-fold lower compared to binding to SKOV-3 cells, and could not be saturated (see Supplementary Figure S4). This demonstrates that binding of ZHER2:342-SR-HP1 is HER2-dependent. Binding of 125I-HP2 to both HER2-expressing cell lines pre-treated with ZHER2:342-SR-HP1 was significantly (p<0.00005) reduced when receptors were blocked with a large excess of parental anti-HER2 Affibody molecules, or when cell-bound ZHER2:342-SR-HP1 was saturated by a large excess of non-labeled HP2 (Figure 2 C and D). Binding of 125I-HP2, i.e. binding without pre-treatment with ZHER2:342-SR-HP1, was also significantly (p<0.00005) lower than with pre-treatment (Figure 2 C and D). The same was true for binding of 111In-HP2 (Figure 2 E and F). In addition, binding of both 125I-HP2 and 111In-HP2 to HER2-negative UN-SCC74B cells pre-treated with ZHER2:342-SR-HP1 was much lower compared to binding to SKOV-3 cells, and could not be saturated (see Supplementary Figure S5). This demonstrated that binding of ZHER2:342-SR-HP1 to cells is dependent on both HER2 and the presence of bound ZHER2:342-SR-HP1. Binding specificity. Binding of 111In-ZHER2:342-SR-HP1 to HER2-expressing cells SKOV-3 (A) and BT474 (B) is saturable. 125I-HP2 binds to SKOV-3 (C) and BT474 (D) cells pre-treated with ZHER2:342-SR-HP1 (1). Saturation of HER2 by large molar excess of non-labeled ZHER2:342 (2) or saturation of ZHER2:342-SR-HP1 by large molar excess of non-labeled HP2 (3) reduced binding significantly. Binding of 125I-HP2 without pre-treatment with ZHER2:342-SR-HP1 is significantly lower (4) than with pre-treatment. The same is the true for 111In-HP2 (E and F). Cells were incubated with the labeled compounds at 37 ºC. Data are presented as a mean value and standard deviation for three cell culture dishes. Error bars might not be seen in some, because they are smaller than the symbols. Cellular processing of radiolabeled conjugates by SKOV-3 and BT474 cells after interrupted incubation is presented in Figure 3. The pattern of cellular retention and processing of 111In-ZHER2:342-SR-HP1 was similar for both cell lines. The initial dissociation phase (ca. 4 h) was followed by a plateau at approximately 80% of initially bound radioactivity (Figure 3 A and B). Internalization was relatively slow for 111In-ZHER2:342-SR-HP1. The internalized fraction at 4 h was 8.0±0.3 % and 11±1% for SKOV-3 and BT474, respectively. At 24 h, the respective values were 24.0±0.7 % and 21±3 %. The processing and retention profile for the 111In-HP2: ZHER2:342-SR-HP1 complex was similar to the profile of 111In-ZHER2:342-SR-HP1, with somewhat higher internalization rate (Figure 3 A and B). The overall cell-associated radioactivity was still approximately 80% of initially bound radioactivity at 24 h. The cellular retention profile of the 125I-HP2: ZHER2:342-SR-HP1 complex was different. An initial release was not followed by a plateau, but by a more shallow decrease. The profile of the second descendent segment of the retention curve correlated well with the profile of membrane-bound activity of the 111In-HP2:ZHER2:342-SR-HP1 complex. The cellular retention of radioactivity at 24 h was 49±1 % and 40.2±0.4% for SKOV-3 and BT474, respectively. According to LigandTracer measurements, the equilibrium dissociation constant (KD) of 111In-ZHER2:342-SR-HP1 binding to SKOV-3 cells was 6±2 pM at both room temperature and 4 °C. The interaction of radiolabeled HP2 with ZHER2:342-SR-HP1-treated HER2-expressing cells was best fitted to a 1:2 interaction model, suggesting that the interaction has two dissociation constants: 293±112 pM and 12.8±6 nM for 125I-HP2, and 336±13 pM and 15±5 nM for 111In-HP2 (Figures S6-8). Comparison of intravenous (iv) and subcutaneous (sc) injection routes of 111In-ZHER2:342-SR-HP1 (Table S1) suggested more rapid blood clearance of 111In-ZHER2:342-SR-HP1 after iv injection in comparison to that after sc injection. Intravenous injection of ZHER2:342-SR-HP1 was selected for further studies. In vivo stability tests demonstrated that at 1 h after injection, 96.8±0.5%, 98.7±0.2%, 49.7±0.2%, of blood-born radioactivity was associated with 111In-ZHER2:342-SR-HP1, 111In-HP2 or 125I-HP2, respectively. Data regarding the specificity of 111In-ZHER2:342-SR-HP1 are presented in Figure 4 A. The uptake in both HER2-negative Ramos (0.16±0.06 %ID/g) and saturated SKOV-3 (0.5±0.1 %ID/g) xenografts was significantly (p <0.05) lower than the uptake in non-saturated SKOV-3 xenografts (8±2%ID/g), demonstrating that tumor targeting was HER2-specific. The difference in biodistribution after injection of 5, 30 and 100 µg 111In-ZHER2:342-SR-HP1 in mice bearing SKOV-3 xenografts was within error of measurements (Figure 4 B). Cellular processing of 111In-ZHER2:342-SR-HP1 (A and B), 111In-HP2 (C and D), and 125I-HP2 (E and F), by HER2-expressing SKOV-3 (A, C, and E) and BT474 (B, D and F) cells after interrupted incubation with labeled compounds. In the case of labeled HP2, cells were pre-treated with non-labeled ZHER2:342-SR-HP1. Cells were incubated with the labeled compound at 37 oC. Circles show total cell-associated radioactivity. In the case of radiometals, an acid wash was used to discriminate between the membrane-bound (squares) and internalized (triangles) radioactivity. Data are presented as a mean value and standard deviation for three cell culture dishes. Error bars might be not seen when they are smaller than the symbols. In vivo targeting using 111In-ZHER2:342-SR-HP1 at 5 h p.i., demonstrating the HER2-specificity of 111In-ZHER2:342-SR-HP1 in vivo (A). All animals were injected with 5 µg 111In-ZHER2:342-SR-HP1. The blocked group with HER2-positive SKOV-3 xenografts was co-injected with an excess amount (500 μg) of non-labeled ZHER2:342 Affibody molecule (green bars). A group with HER2-negative Ramos xenografts was used as a negative control (red bars). Biodistribution in mice bearing SKOV-3 xenografts after injection of 5 (blue bars), 30 (green bars) and 100 (red bars) µg 111In-ZHER2:342-SR-HP1 (B). Data are presented as an average %ID/g with standard deviation for 5 mice. Pre-injection of ZHER2:342-SR-HP1 at any tested dose provided significantly (p<0.05) higher uptake of 125I-HP2 in SKOV-3 xenografts compared with the uptake of 125I-HP2 without pre-injection of ZHER2:342-SR-HP1 (Table 1). This indicates that the tumor accumulation of 125I-HP2 is dependent on the PNA-PNA interaction, i.e. pretargeting. Furthermore, the tumor uptake after injection of 5 µg of 125I-HP2 was significantly (p<0.05) lower than the uptake after injection of 1 µg, when animals were pre-injected with 5 µg of ZHER2:342-SR-HP1. This demonstrates that the tumor uptake of 125I-HP2 is saturable. At the injected 125I-HP2 dose of 1 µg, the uptake of 125I-HP2 in tumors was significantly higher than in any organ or tissue including kidneys. The influence of the injected ZHER2:342-SR-HP1 dose on the uptake of 125I-HP2 was moderate, but the uptake was significantly higher in lung, spleen and kidneys after pre-injection of 100 µg ZHER2:342-SR-HP1 compared with 5 µg. The kidney uptake of 125I-HP2 after injection of 5 µg was 4-fold higher than after the injection of 1 µg. The tumor-to-blood, -lung, -liver and -spleen ratios were significantly higher for 1 µg injected 125I-HP2 (Table 1). The tumor uptake of 111In-HP2 after pre-injection of ZHER2:342-SR-HP1 (19±2 %ID/g) was significantly (p<0.05) higher than the uptake without pre-injection (0.3±0.1 %ID/g) (Table 2). This suggests that the tumor uptake of 111In-HP2 was dependent on pretargeting. Importantly, the uptake of the radiometal-labeled HP2 was ca. 2-fold higher in tumors than in kidneys (Table 2). Biodistribution of 125I-HP2 in BALB/C nu/nu mice bearing SKOV-3 xenografts at 1 h p.i. ZHER2:342-SR-HP1 was pre-injected 4 h prior to 125I-HP2 injection. Data are presented as an average %ID/g with standard deviation for 5 mice. In vivo specificity of 111In-HP2 in BALB/C nu/nu mice bearing SKOV-3 xenografts at 1 h p.i. in the presence and absence of ZHER2:342-SR-HP1; one group of mice were pre-injected with 100 µg of ZHER2:342-SR-HP1 4 h prior to injection of 111In-HP2. Data are presented as an average %ID/g with standard deviation for 5 mice. * significant difference (p<0.05) between groups. A comparison of the biodistribution of 111In-HP2 and 125I-HP2 (both 1 µg, 1 h p.i.) in SKOV-3 xenograft-bearing mice after pre-injection of ZHER2:342-SR-HP1 (100 µg) is presented in Table S2. There was no significant difference in tumor uptake. The kidney uptake of 111In-HP2 exceeded kidney uptake of 125I-HP2 2-fold. However, the concentration of radioactivity in other organs was significantly higher for 125I-HP2 than that of 111In-HP2 at 1 h p.i. 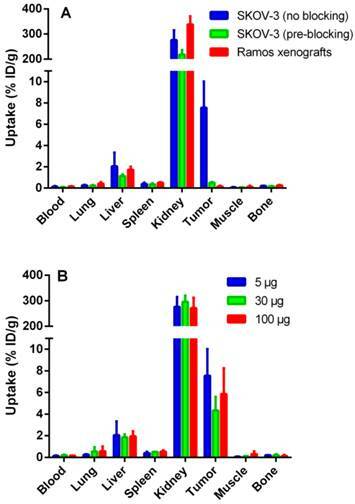 Consequently, 111In-HP2 provided significantly higher tumor-to-blood, tumor-to-lung, tumor-to-liver, tumor-to-bone, and tumor-to-muscle ratios than 125I-HP2 (p<0.05) (Table S3). The results of the imaging experiment are presented in Figure 5. Injection of 111In-HP2 after pre-injection of ZHER2:342-SR-HP1 resulted in clear high-contrast visualization of SKOV-3 xenografts (Figure 5, group A). In agreement with ex vivo measurements, the tumor uptake exceeded the uptake in any other tissue type. Tumors were not visualized when 111In-HP2 was injected without pre-injection of ZHER2:342-SR-HP1 (Figure 5, group B). The reference 111In-labeled DOTA-ZHER2:K58 Affibody molecules also provided clear imaging of tumors (Figure 5, group C), but the renal uptake was much higher than the tumor uptake. Gamma-camera imaging of HER2 expression in SKOV-3 xenografts using radiolabeled 111In-HP2 and 111In-DOTA-ZHER2:K58 Affibody molecules. All animals were injected with 650 kBq of a radiolabeled compound 1 h before image acquisition. A single image of all animals simultaneously was acquired. Animals were pre-injected with 100 µg ZHER2:342-SR-HP1 4 h prior to injection of 1 µg 111In-HP2 (A). 111In-HP2 was injected without pre-injection of ZHER2:342-SR-HP1 (B). Animals were injected with 2 µg 111In-DOTA-ZHER2:K58 (650 kBq) (C). 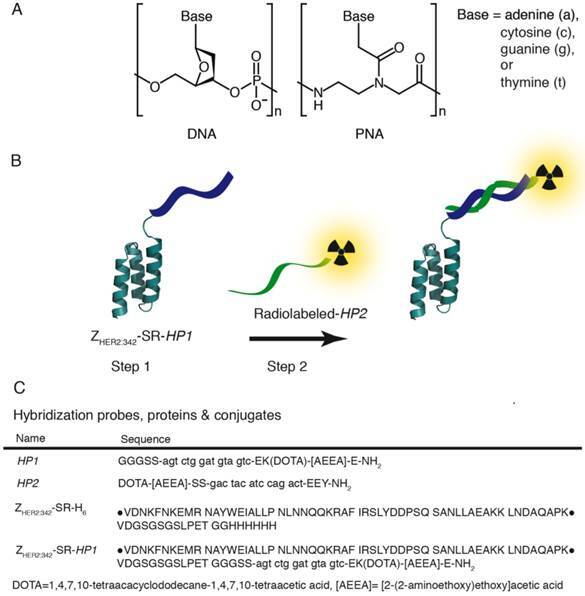 Affibody molecule-based, PNA-mediated pretargeting might be a powerful tool for improving the delivery of radionuclides to tumors. However, there are multiple possible pitfalls with this strategy. For example, Affibody molecules and PNA might create mutual sterical hindrances for binding to a tumor-associated molecular target and a secondary hybridization probe, respectively. The Affibody-PNA chimera might bind nonspecifically to cells or blood proteins, or might be internalized by target cells too rapidly. All these phenomena would compromise the intended accumulation of radionuclides in tumors. Our study shows that this is not the case using our design of hybridization probes. The 111In-ZHER2:342-SR-HP1 chimera retained the capacity to bind specifically to HER2-expressing living cells (Figure 2 A and B), with a very high affinity determined for the binding to SKOV-3 cells (KD = 6±2 pM). The internalization of 111In-ZHER2:342-SR-HP1 was slow (ca. 10% at 4 h) in both cancer cell lines tested (Figure 3 A and B), which is a precondition for a successful pretargeting. The binding of 125I-/111In-labeled HP2 to cancer cells in vitro was very low without ZHER2:342-SR-HP1 pre-treatment (Figures 3 C, D, E and F). In vitro saturation experiments also demonstrated that HP2 binding was mediated by PNA-PNA hybridization and dependent on the binding of ZHER2:342-SR-HP1 to HER2 cells (Figures 3 C, D, E and F). Binding of radiolabeled HP2 to ZHER2:342-SR-HP1 pre-treated HER2-expressing cells was described by two apparent dissociation constants: a predominant subnanomolar (293±112 and 336±13 pM, for 125I-HP2 and 111In-HP2, respectively) and a low nanomolar (12.8±6 and 15±5 nM, 125I-HP2 and 111In-HP2, respectively). Both interactions had the same association rate but differed in the dissociation rate (Figures S5 and S6). Interpretation of the affinity pattern is difficult, as the system involves multiple interactions (interactions of receptors of HER family on cells, an interaction of ZHER2:342-SR-HP1 with HER2, an interaction of radiolabeled HP2 with ZHER2:342-SR-HP1, and interaction of ZHER2:342-SR-HP1:HP2 complex with HER2). We can observe only binding and dissociation of HP2. Some speculation might be based on the facts that affinity of HER-family receptors to their ligands depends on homo-and heterodimerization of receptors (25), and that ZHER2:342-SR-HP1 interaction with HER2-expressing cells has a single dissociation constant. We may hypothesize that homo-and/or heterodimerization of HER2 influences binding of ZHER2:342-SR-HP1:HP2 and results in conformations determining somewhat weaker binding. However, it is difficult to test this hypothesis experimentally. The use of radiometal label for HP2 provided better retention of radioactivity (81.2 ± 0.8% and 78.9 ± 0.3% at 24 h for BT474 and SKOV3, respectively) than radioiodine (40.2 ± 0.4% and 49 ± 1 % at 24 h for BT474 and SKOV3, respectively) presumably due to residualizing properties of 111In. Importantly, the blood clearance of ZHER2:342-SR-HP1 was rapid. The concentration of the blood-born activity was 0.16±0.02 %ID/g in NMRI mice at 4 h (Table S1) or 0.14±0.05 %ID/g in tumor-bearing BALB/C nu/nu mice at 5 h after injection of 111In-ZHER2:342-SR-HP1. For comparison, the blood concentration in BALB/C nu/nu mice at 4 h after injection of three 111In-labeled ZHER2:342 derivatives, ABY-25, DOTA-ZHER2:2395-C and synthetic DOTA-ZHER2:342-pep2 was 0.21 ± 0.03, 0.19 ± 0.05 and 0.11 ± 0.03 %ID/g, respectively (30). Thus, the clearance of HP1-conjugated ZHER2:342was as quick as clearance of non-conjugated ZHER2:342, and binding of ZHER2:342-SR-HP1 to blood components did not influence the blood clearance rate. Further in vivo studies confirmed our hypotheses. The binding of 111In-ZHER2:342-SR-HP1 to HER2-expressing SKOV-3 xenografts was HER2-specific (Figure 4 A). The accumulation of both 125I- and 111In-labeled HP2 in tumors was shown to be dependent on pretargeting, and without ZHER2:342-SR-HP1 pre-injection the tumor uptake was very low (Tables 1 and 2, Figure 5). Affibody-based PNA-mediated pretargeting can thus provide higher accumulation of radiometals in tumors in comparison with kidneys (Table 2). The use of radioiodinated and radiometal-labeled HP2 provided equal uptake of radioactivity in tumors (19±8 %ID/g and 18.5±1.5 %ID/g, for 125I-HP2 and 111In-HP2, respectively) at 1 h after injection (Table S2). At this time point, the renal uptake was significantly higher for 111In-HP2, but radiometal-labeled HP2 provided significantly lower uptake in blood, lung, liver, spleen and muscle. Such pattern might be explained by difference in retention of radiometabolites in the catabolic sites, especially kidneys. We may expect that both 125I-HP2 and 111In-HP2 are reabsorbed in kidneys to the same extent. However, the residualizing radiometal label remains trapped in kidneys after proteolytic degradation, while “leaky” metabolites of non-residualizing radioiodine label returned to blood circulation. The results of in vivo stability test show much higher fraction of low-molecular-weight catabolites in blood for 125I-HP2 than for111In-HP2, which supports this reasoning. Earlier, we have evaluated other approaches to radionuclide therapy using Affibody molecules. The slow internalization of Affibody molecules by cancer cells, but rapid internalization in kidney, indicated that the use of non-residualizing labels is possible. This results in rapid excretion of radiometabolites from kidneys, but long retention of radiolabeled Affibody molecules on the surface of cancer cells. In fact, we have shown that the use of non-residualizing labels, such as 131I-para-iodo-benzoate (31) or 188Re-GGGC (32), provide higher uptake of radioactivity in tumors than in kidneys. However, the high energy of the beta-particles emitted by 188Re makes it suitable only for treatment of bulky, non-operable tumors. The medium-energy beta particles emitted by 131I are more suitable for eradication of small tumors, but the high abundance, high-energy gamma decay of 131I indiscriminately irradiates the patient's whole body. In contrast, the versatile DOTA chelator in HP2 enables labeling this probe with the alpha-emitting radiometals 212/213Bi and 227Th for treatment of micro metastases, the low-energy beta emitter 177Lu for small tumors, and the high-energy beta emitter 90Y for bulky lesions (33-34). This chelator can also be labeled with 111In and 68Ga for theranostics imaging. A major advantage of pretargeting in comparison with conventional RIT is the rapid clearance of radiolabeled HP2 from blood and the low accumulation in bones, which reduces exposure of radiosensitive bone marrow. We can foresee some potential advantages in comparison with antibody-based pretargeting methods. The major one is the rapid clearance of ZHER2:342-SR-HP1 from blood, which makes an additional injection of a clearing agent unnecessary. In addition, Affibody molecules can be cost-efficiently produced in high yields in prokaryotes, and PNA-based hybridization probes can be synthesized with relative ease using standard peptide synthesis techniques. This would appreciably reduce the costs of the agents in the case of clinical translation. In conclusion, the Affibody-based PNA-mediated pretargeting is feasible and provides higher accumulation of radionuclides in tumors than in kidneys. Supplementary data, figures and tables. This research was financially supported by grants from the Swedish Cancer Society (grant 2012/354) and the Swedish Research Council (grants 521-2012-2228 and 621-2013-5135).